Big South-facing Pool/Mickey Mouse Jacuzzi Facing Nature Area - INCLUSIVE RATES! YOU ASKED FOR IT...ALL-INCLUSIVE RATES! IT REALLY IS AN IDEAL FLORIDA House!!!! In addition to comfortable accommodation, there are added benefits that make a difference for you and your friends and family. GAMES ROOM. POOL TABLE, AIR HOCKEY TABLE. Free Wi-Fi INTERNET ACCESS. FREE TELEPHONE CALLS TO ALL USA AND CANADA. Backing onto a nature conservation reserve and woodlands this Orange Tree luxury house is on a tranquil estate set among original orange groves. This is a top of the range house which is set on a premium plot. The pool/lanai/spa is south-facing and if the sun is shining (which it does almost every day in Florida) the pool area remains sun-soaked all day. The pool has a child safety fence and is fully screened. The house is fully equipped with all that is needed for easy living. The Kitchen having stove, dishwasher, microwave, fridge freezer with ice maker. All bed linen and towels are provided for your use. The house is looked after by a reputable management company. There is a laundry room with washer and dryer. All of the bedrooms have a TV, The great room also has a large TV with DVD & VCR and there is a selections of DVD's and VCR's, books and board games for your use, and of course there is also a BBQ for your private use. Orange Tree is close (20 Minutes) from Disney World, with Universal Studios, SeaWorld and many large shops close at hand. Wal-Mart for all your needs is just three miles. There are many restaurants and golf courses close at hand and a local Harley Davidson hire shop. Cocoa Beach and Cape Canaveral on the east coast are about an hour away whilst Clearwater Bay, Tampa and St Petersburg are one and a half hours on the west coast. Strictly no Smoking in the house- you may smoke on the Lanai. Please contact owners for payment details. Bath and kitchen towels are provided. Large towels provided for the swimming pool. Main living area and one of twin bedrooms have DVD Player. There are different books for your vacation reading. Several board games provided for your enjoyment. There are some pool toys available for use. There are several videos for your use. Private outdoor pool - heated. Child safety fence provided for your use. Private outdoor spa - heated. This Ideal Florida Villa is perfect for friends and families to enjoy the attractions of the greater Orlando area. In town for training? A short-term work assignment? Convention? This is an ideal solution for your accommodation needs. This house is awesome! We had plenty of room for three families (all adults had their own bathroom). The house is clean and has all the supplies you will ever need. The grocery store is very close and so is a fresh fruit stand. We loved the Mickey hot tub and heated pool. We were in Florida for a college softball tournament but also took a trip to Universal & NASA. The location of this house is perfect for going to the theme parks or going to the beach! I highly recommend this house :) We had a great stay!!!! Our family has been vacationing in Orange Tree Community since 2001. This home we stayed in our last visit was the best to date. The booking process was very easy. We loved the all inclusive price. We have never gone to Florida and not had our pool heated. The pool and spa were heated also! We had stayed in other homes where we had to argue the definition of pool heat with management. The home and pool area were the cleanest we had ever experienced. A 5 star experience all around we will be booking again with this property. Thank you for sharing your home with us. Very large,clean and open concept villa. Perfect for my family and will stay with you again! Awesome communication with owner.I choose this villa because it had a 1 level large floor plan and it was everything we needed and then some.The location is great and very close to walmart,grocery store and plenty of choices to eat at and a very simple commute to all the attractions but far enough away from the rat race-very peaceful and quiet.We also had our medically fragile grandson with us and there is an emergency room very close by also.My family also really enjoyed the pool,spa and game room.We will book this same villa or next trip down. Thank you for the kind words. We are so glad that your family enjoyed the visit. Being close to everything but far enough away to miss all the traffic is one of the best things about the house. We even walk to Publix sometimes for a couple of small things.Hopefully you were able to take advantage of the fruit stand by the subdivision. We enjoyed some wonderful fruit on our last visit. I am so glad everything worked out and your grandson was able to enjoy his vacation. Let me know when you are planning your next vacation and don't forget to take advantage of the discount for return guests. 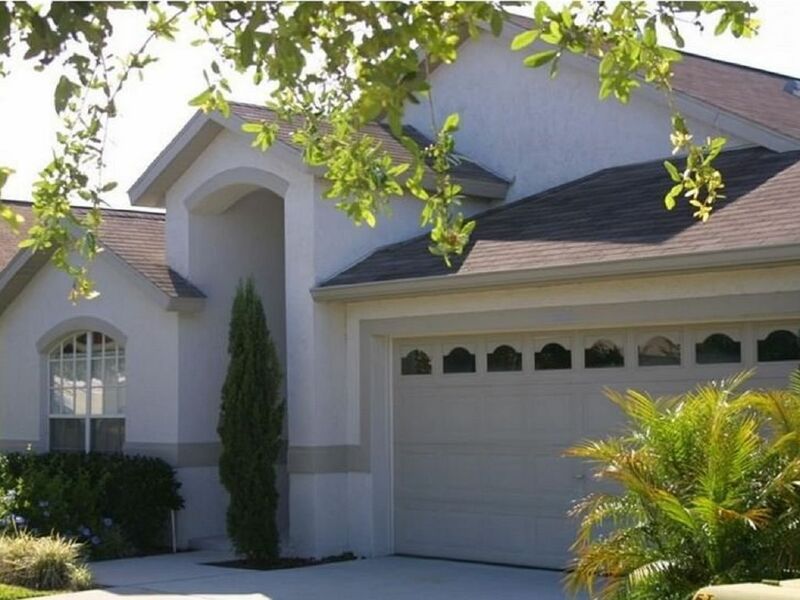 Very nice home near Disney! We thoroughly enjoyed our stay here. The home was well furnished and super clean. We also loved the pool and hot tub after long days at the Disney parks. Would stay here again! We are glad your visit was a pleasant one. We are always ready for the pool and spa after being in the parks. Thank you for your kindness. Don't forget the discount on your return visit. This place was perfect for us. Clean, well furnished, 0 problems. We’ll be looking at this place again for our next trip. Thank you for taking the time to do a review. We are glad it was a relaxing visit for your family. We look forward to having you stay with us on your next trip. Don't forget the added incentive of the discount for returning guests. Fantastic house for our week at Disney with our 4 grandchildren! The house was perfect with everything we needed already there. The pool was a marvelous bonus for the 4 grandchildren. The location provided easy access to the Disney parks and was close to Publix’s and places to eat. The house could not have been more perfect!! Thank you for taking time to share this wonderful review. There is nothing like spending time with family.We are so glad that your grandchildren had a great time in the pool. I hope the adults got to spend a while in the spa. I have found the pool and spa a great place to relax after a day in the parks. We are glad that you found all that made it feel like home to you and hope that you will consider staying with us again when you are in the area. Don't forget our returning guest discount. All-inclusive rates (Taxes, Clean and Pool/Spa Heat) eliminate surprises when booking online for minimum of 7 nights. Cleaning fee applies to stays fewer than 7 nights. Call or e-mail to confirm actual rates including discounts for longer stays, returning guests, and seasonal specials. Online booking rates will be adjusted to reflect discounts before your credit card is charged.